Review Summary: Sometimes interesting ideas go haywire due to amateurish and inept writing. NAKSHATRA is a glaring example of this statement. Sometimes interesting ideas go haywire due to amateurish and inept writing. NAKSHATRA is a glaring example of this statement. The lead protagonist in 'Nakshatra' (played by Shubh) is someone who doesn't quite stand a chance to be a script writer in Bollywood as he detests borrowing from Hollywood DVDs. In the times when he is going through a writing block, he gets on with his Play Station and keeps beating the pulp out of his fictional enemies. In his further free time, he visits museums for the launch of diamonds which are 'desh ki dharohar'. It just doesn't stop at that. In 'khel khel mein', he also cracks the alpha numeric code of the diamond safe which needs to be pulled out after crossing three layers of barriers. All this while, he is oblivious to the fact that he is being used and his multi faceted personality turns out to be the very cause of him being labelled as a criminal. Sometimes, interesting ideas go haywire because of amateurish and inept writing. 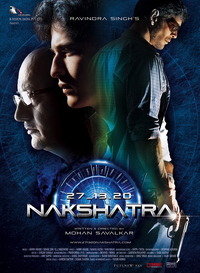 Carelessly scripted Nakshatra suffers because the writer takes the viewer for granted. Besides, if you''re attempting a suspense thriller - which Nakshatra is - the identity of the culprit should catch you by complete surprise, when the mask is taken off.